Deema K Shehabi is a poet, writer, and editor. The daughter of Palestinian parents, she grew up in the Arab world and moved to the United States in 1988. She finished her education in the US, and she received an MS in journalism. Her poems have appeared widely in journals and anthologies such as The Kenyon Review, Literary Imagination, New Letters, Callaloo, Massachusetts Review, Perihelion, Drunken Boat, Bat City Review, Inclined to Speak: An Anthology of Contemporary Arab American Poetry, and The Poetry of Arab Women. 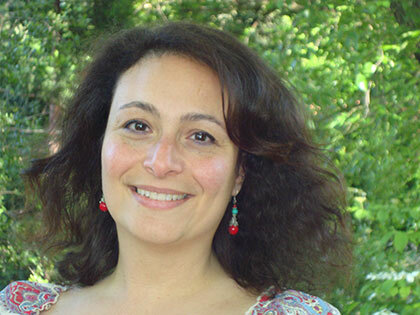 Deema’s poems have been nominated for a Pushcart prize four times, and she served as Vice-President for the Radius of Arab-American Writers (RAWI) between 2007 and 2010. Her full collection Thirteen Departures From the Moon was published by Press 53 in 2011. She is also co-editor with Beau Beausoleil of Al-Mutanabbi Street Starts Here (PM Press), for which she received the Northern California Book Award’s NCBR Recognition Award. During 2009 – 2013 she worked with Marilyn Hacker on the great poem sequence Disaspo/Renga. You can listen to this interview with Deema on KKRN Radio. As part of this interview she talks about working with Marilyn Hacker on Diaspo/Renga. She currently resides in Northern California with her husband and two sons.